(0 Customer Reviews) | Write Review 12 issues per year What Doctors Don't Tell You is a health advice magazine with articles on how to beat asthma, arthritis, cancer, depression and other chronic conditions. It focuses on alternative health treatments that have been scientifically proven to work. Our main work is producing the long research articles that can make a big difference to people’s health. They’re so well respected that they’ve even been cited in courts of law! It’s something we’ve been doing since 1989. Along the way, we’ve helped many thousands of people regain their health after they’d be written off by medicine, and we’ve also attracted opponents who want to shut us down. Despite their efforts, we have won ‘Most Popular Health Site of the Year’ award three times, and our monthly magazine sells in stores across the UK and the US. Unfortunately What Doctors Don't Tell You is not available in your country due to publisher restrictions. 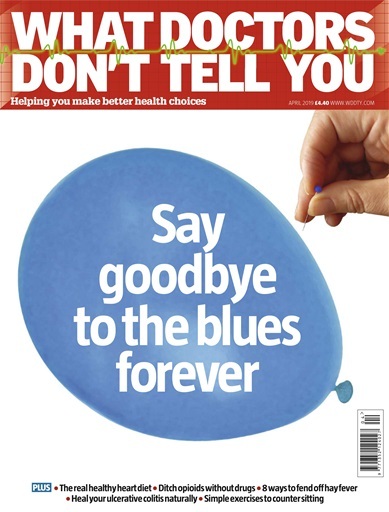 What Doctors Don't Tell You is a health advice magazine with articles on how to beat asthma, arthritis, cancer, depression and other chronic conditions. It focuses on alternative health treatments that have been scientifically proven to work. You'll receive 12 issues during a 1 year What Doctors Don't Tell You magazine subscription. You'll receive 12 issues during a 1 year What Doctors Don't Tell You magazine print subscription.